Our first CD compilation release is out! 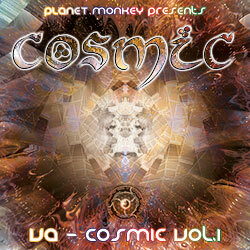 Cosmic has been the main psychedelic trance event in Edinburgh, Scotland for almost 10 years now. For this compilation, we collaborated with some of the best artists we’ve invited in the past and our new upcoming producers. We would like to thank the artists, our friends and all the people that contributed towards this project and keep the underground psychedelic scene rolling! For digital downloads based on donation, please visit our Bandcamp page.